Imagine you are one of a dozen men tasked with the responsibility of whether a young man is executed or not; that his fate relies on the choice you make; guilty or innocent. Now imagine you stand alone in your choice - would you give in to the pressure of your fellow jurors to agree with them or fight for what you believe to be true? This is the basic premise of Reginald Rose's Twelve Angry Men where we see twelve jury members tackle the evidence presented before them, their personal prejudices, and each other to reach a unanimous decision that will seal a sixteen year old boy's fate. Most famous as a 1957 feature film starring Henry Fonda, the play began life as a television play presented in 1954 before the first theatrical adaptation was staged. 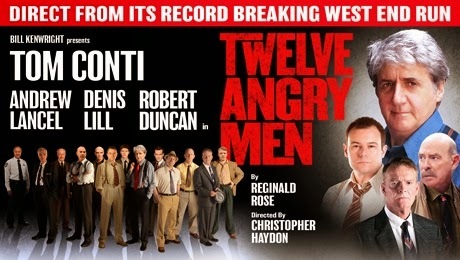 This touring production stars Tom Conti, Andrew Lancel, Gareth David-Lloyd and Robert Duncan amongst a cast who perform Rose's script with aplomb. The piece relies on a strong ensemble and there really isn't a weak link amongst a cast who confidently grasp the audience's attention, building tension throughout the play until the final decision is made. It is a credit to the actors that they are able to make such a wordy play into such a gripping experience. Rose's script is more or less tight, though a little slow to start and he peppers the dialogue with many a humorous line and insights into the personal lives of the anonymous jurors. Rose creates characters who feel rounded and complete, despite the small clues we are given, and creates believable tension and conflict amongst them when facts face off against personal impressions and preconceptions. His use of logic in having characters deconstruct and evaluate the evidence and witnesses is strong and he imbues the play with a variety of themes that rear their heads at one point or another; such as consensus-building, standing strong against the odds and the potential outcomes of human error. Ultimately we realise that no justice system is truly perfect. Christopher Haydon's direction is quite assured and confident although he has some lines fall flat or presented somewhat clumsily. Haydon utilises the stage throughout; moving his actors about fluidly and expressively and thus avoiding the creation of a static and boring theatrical visual. A drop displaying the Scales of Justice hides the jury room which is soon revealed contained within a steel girder cube complete with more naturalistic doors and windows and a table upon a slowly moving revolve (which adds to the sense of drama). Michael Pavelka's design is enhanced by the sound and lighting designs of Dan Samson and Mark Howett respectively and the lighting is especially moody and subtle further creating a sense of animation about the unit set. An intriguing take on a whodunit, Twelve Angry Men offers a chance to have us ask ourselves how we might act in any one of the jurors' place as we bear witness to the struggles and difficulties that such a position offers. And, ultimately, life is created by the choices we make. For ourselves and for others.